We are interested in serious soccer players who are dedicated to the sport and excellence. You will find that the experience with our club is a time of growth and maturity for your child. Not only does our club provide premier coaching to all players, but it also offers its teams the opportunity to compete against the highest level of competition. Our club will help your child become a physically stronger, more skilled and tactically better soccer player. 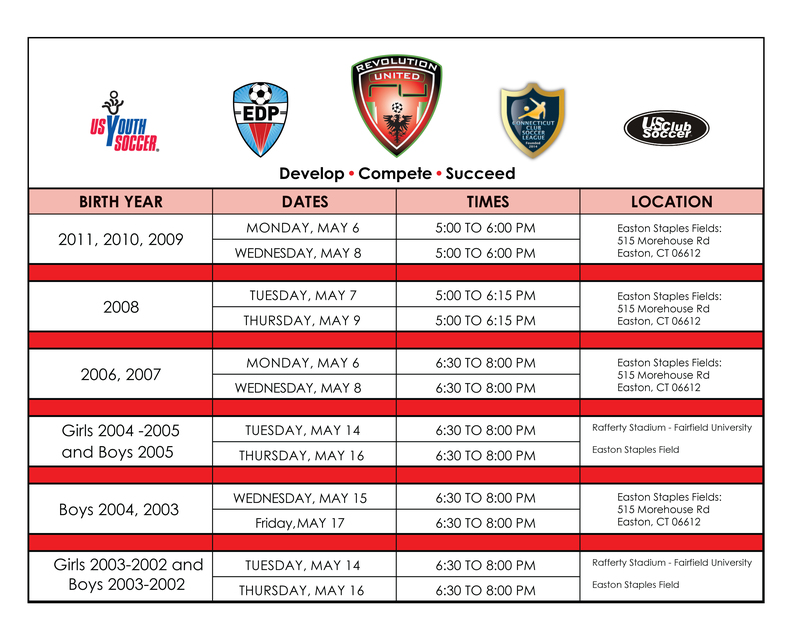 Develop: At Revolution United FC we are passionate about the development of successful soccer players. Our expert coaches guide and support our players during the different phases of development from nourishing the love for the game, to evolving their individual technical skill set and knowledge. Our coaches also help them to develop other life skills we believe essential to success like discipline, sportsmanship, respect, responsibility, self-esteem and friendship. Compete: We strive not only to have the most competitive teams for each age category, but also the most respected and organized teams. After our players have graduated from the developmental stage, our main focus still remains on the individual player’s skill set and their role on the team, but gradually more focus is placed on competition and strategy. Succeed: We strive for excellence and our goal is to provide the best resources and guidance to allow players to excel in the proper environment in order to reach their highest potential both on a personal level and on a team level. The Coaching Staff is the most important factor in your child's development as a soccer player. Through the combination of mandatory practices, open practice sessions, league play, cup play and tournaments, your child will learn what it takes to become the best soccer player that he or she can be. Your child's ultimate success through this experience will be affected by his or her attitude and effort. Good luck in your quest to become a better soccer player and we wish you a successful tryout.